Trade totally worth it now. They must really like what they are seeing; didn't even wait till after Preseason. Surprised the agent went for this. Wonder whats up with the Donald contract situation. Maybe he is asking for way too much. Great signing, great trade. Gurley and Goff will be next in line. I'm thinking that AD might better plan for franchise tag for a few years. Can't see them doing anything long term with him at the money he is going to want. It's a tough business. Almost like he was too good and played himself out of money. Really good signing for the Rams. We got Cooks for our 1st round pick and now have him for the next 6 years. 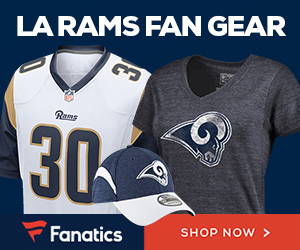 Don't see how the Rams can sign Goff, Gurley and Donald to big deals now so going to have to choose. Goff of course will be signed to a big 2nd contract, but you have to wonder if Gurley will and whether they just want to franchise Donald once or twice. One down....great signing....So Goff to Woods, Cooks, Kupp, and Everett for the next few years....that's ok by me. Yeah, I agree....Sully as well....maybe they keep Brock, maybe not.